Those who harness the hidden, but simple language that Excel runs quietly in the background to automate 80% of their manual tasks at work. There's no question that spreadsheets have revolutionized the modern workplace (unless you're Fred Flintstone), but the amount of work to keep them up to date is enough to justify another summer student. That's why we listened to your requests for advanced Excel training and reached out to Daniel Strong and his best-selling Ultimate Excel Programmer Course on Udemy. So you can learn from the best in the business in a logical step-by-step process. 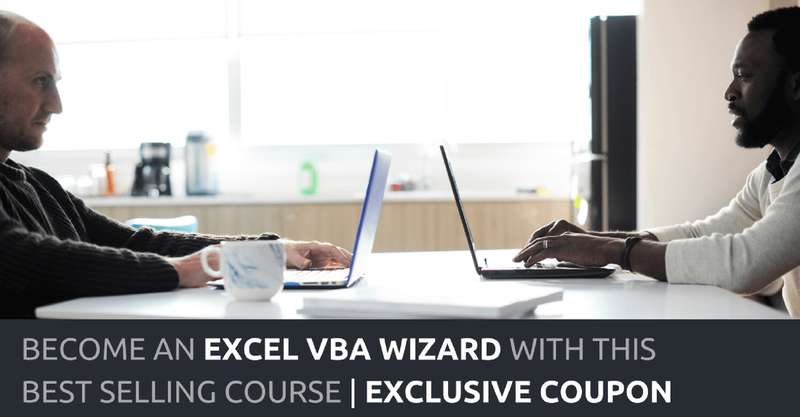 This course has over 58,000 students, giving rave reviews, and you'll quickly learn everything you need to know about Excel VBA and Macros. Are You a "Doer", or just a "Talker"
Check out how well Daniel explains the EVALUATE function, in a clear and concise way. His voice isn't monotone, nor is he over the top, he's easy to learn from. Plus Daniel has agreed to throw in his e-book "Essential Excel VBA Snippets". It's full of the most common and powerful bits of code so you can copy and paste your way to powerful tools quickly. Ordinarily, Daniel sells this course on Udemy for $200 (a decent deal for a resource of 175 lectures that you'll have forever). But for us, Daniel is providing his coupon code giving us 91% off the regular price! You can have this course for $15! ​So if you're serious about automating your job, then click here (DEAL EXPIRED, BUT YOU CAN STILL GET DAN'S EBOOK) and get this best-selling course now! "I've been using Excel since my early teens, and very early on realized that I absolutely love it. After working on various projects in my spare time for years, improving the lives of those that used my programs, I knew this was more than just a hobby for me; it's my passion. A few years back, I got my first opportunity to program in Excel, but when I landed the job I realized my Excel skills were lacking. I HAD TO LEARN VBA! I studied and studied what I could online and in books, but I wasn't able to learn much that way. I had to dive into my first project for months and months - basically just teaching myself and "figuring it out". I realized there was a huge need for someone to teach Excel VBA in a simple and visual way - then anyone could learn VBA! I started a YouTube channel, mostly for myself as a reference tool, but people started to bite. People flooded my inbox with questions and comments that I was literally changing their lives for the better. My passion is and always has been teaching, and I've turned thousands of people into Excel automation masters. AND Daniel's e-book "Essential Excel VBA Snippets"